You can link any two tasks in a project to show their relationship (also called a task dependency). Dependencies drive the project schedule — once you link the tasks, every change you make to the predecessor affects the successor, which affects the next one, and so on. Hold down Ctrl and select the two tasks you want to link (in the Task Name column). Choose Task > Link Tasks. To remove a link, select the two linked tasks and then choose Task > Unlink Tasks . Project creates a simple finish-to-start task link by default, which means the first task (the predecessor) needs to finish before the second task (the successor) can start. If you are a Project Online subscriber, you can also select specific tasks to link to using a drop-down box from the Predecessors or Successors column. 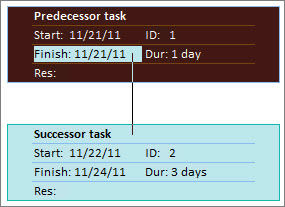 Find the Predecessors or Successors column and select the cell for the task you want to link. Note: The Successor column is not shown by default. To show it, go to the last column in the row, and select Add New Column. Choose Successors. In the hierarchical list of all of your tasks, scroll up or down to find the task you want, select the check box next to it, and then click anywhere outside of the drop-down box. The task ID of the task you're linking to will appear in the cell. Selecting links from the drop-down is especially useful if the task you want to link to is not located close to the task you're linking from. You can set up Project so that when you insert a new task between linked tasks, the new task is automatically linked to the surrounding tasks. In the Project Options dialog box, choose Schedule and scroll to the Scheduling options in this project section. Select the Autolink inserted or moved tasks check box. Choose View > Network Diagram. Point to the center of the predecessor task box. Drag the line to the successor task box. Point to the predecessor task’s calendar bar. Drag the line to the successor task's calendar bar. When you link a manually scheduled task to another task, Project places the manually scheduled task relative to the other task. Clear the Update manually scheduled tasks when editing links check box. Learn more about manually and automatically scheduled tasks. If you have tasks that depend on the successful completion of an entire project, consider setting up a master project. To highlight how a single task relates to other tasks, use task paths. By default, Project links tasks in a finish-to-start dependency. You can, however, easily change the type of task dependency on the Advanced tab of the Task Information dialog box. To open the Task Information dialog box, double-click the name of the task whose link type you want to change. Note: Double-clicking a link to an external task opens the project containing the task, if the project is available. Externally linked tasks appear dimmed in the task list. If you want to modify the link type for an external task, double-click the externally linked task to open the project that contains the task, and then do the following to modify the linked task. For example, if you linked Task A in Project Z to Task 1 in Project 5, you can modify the link type in the task information for Task 1. Double-click the link line that you want to change. To change a link type, double-click here. To change the type of task dependency, select a different type from the Type list. If you have a task that is currently linked to the wrong task, you can easily modify the link so that it reflects the correct dependency. In the task list, select the task for which you are changing the link. On the Task tab, in the Properties group, choose Information. On the Predecessors tab, in the Task Name column, select the task that should not be linked, and then select a task from the list to identify the correct dependency. Modify the link type, lag time, or lead time in the Type and Lag columns. Tip: To enter lead time, type a negative value in the Lag column, such as –2 for two days of lead time. If your task is no longer dependent on any other tasks, you can remove all of the task's dependencies at once. In the Task Name field, select the tasks that you want to unlink. To select multiple tasks that are not listed consecutively, hold down CTRL and select each task. To select tasks that are listed consecutively, select the first task, hold down SHIFT, and then select the last task that you want to select in the list. On the Task tab, in the Schedule group, choose Unlink Tasks. The tasks are rescheduled, based on any links to other tasks or constraints. Note: Removing a task link removes the dependency between two tasks, as indicated by the link lines between the tasks. If you want to change the hierarchical structure of a task or subtask as part of an outline structure for your project, then you need to outdent the task rather than remove the task link. If your task is linked to several tasks and you need to remove specific links while leaving some intact, you can choose which links to remove in the Task Information dialog box. In the task list, select the task for which you are removing dependencies. On the Predecessors tab, select the dependency that you are removing, and then press DELETE. If a task has any actuals applied, such as an actual start date or a percentage of work completed, the task can't be rescheduled any earlier than the date when the task actually began. If no progress is entered and the task has an inflexible constraint, the constraint can take precedence over task dependencies. For example, if a task has a Start No Earlier Than (SNET) constraint set to July 1, the task is tied to that date and won't be rescheduled to an earlier date, even if its predecessor finishes on June 28 and the successor task could start earlier than July 1. In Project, if you create a task by dragging the pointer on the chart portion of a Gantt Chart view, a Start No Earlier Than (SNET) constraint is set on the task for projects that are scheduled from the start date. For projects that are scheduled from a finish date, a Finish No Later Than (FNLT) constraint is set on the task. If the successor task is completed, it will not move to reflect the link. To reset the task constraint to be more flexible, select the task, choose Information, and then select the Advanced tab. In the Constraint type list, select As Soon As Possible. Project then schedules the task's start date according to the task dependency. To make task dependencies override inflexible constraints for all tasks, choose File > Options > Schedule. In the Scheduling options section, clear the Tasks will always honor their constraint dates check box. When you link tasks in Project, the default link type is finish-to-start. However, a finish-to-start link does not work in every situation. Project provides additional types of task links so you can model your project realistically. The dependent task (B) cannot begin until the task that it depends (A) on is complete. For example, if you have two tasks, "Dig foundation" and "Pour concrete," the "Pour concrete" task cannot begin until the "Dig foundation" task is complete. The dependent task (B) cannot begin until the task that it depends (A) on begins. The dependent task can begin anytime after the task that it depends on begins. The SS link type does not require that both tasks begin simultaneously. For example, if you have two tasks, "Pour concrete" and "Level concrete," the "Level concrete" task cannot begin until the "Pour concrete" task begins. The dependent task (B) cannot be completed until the task that it depends on (A) is completed. The dependent task can be completed anytime after the task that it depends on is completed. The FF link type does not require that both tasks be completed simultaneously. For example, if you have two tasks, "Add wiring" and "Inspect electrical," the "Inspect electrical" task cannot be completed until the "Add wiring" task is completed. The dependent task (B) cannot be completed until the task that it depends on (A) begins. The dependent task can be completed anytime after the task that it depends on begins. The SF link type does not require that the dependent task be completed concurrent with the beginning of the task on which it depends. For example, the roof trusses for your construction project are built offsite. Two of the tasks in your project are "Truss delivery" and "Assemble roof." The "Assemble roof" task cannot be completed until the "Truss delivery" task begins. When inserting a task among linked tasks, you can have a new task linked automatically or not link it at all. To link the new task, select the task that you want the new task to precede, and then choose New Task on the Insert menu. Note: If this doesn't work, on the Tools menu, choose Options, and then select the Schedule tab. Make sure that the Autolink inserted or moved tasks check box is selected. To add the new task without linking it, select the task with which the new task will occur concurrently, and then drag to create the new task in a blank portion of the Network Diagram. On the View menu, choose Gantt Chart. In the Task Name field, select two or more tasks you want to link, in the order you want to link them. To select nonadjacent tasks, hold down CTRL and select the tasks you want to link. To select adjacent tasks, hold down SHIFT and select the first and last tasks you want to link. Project creates a finish-to-start task link by default. You can change this task link to start-to-start, finish-to-finish, or start-to-finish. On the View menu, choose Network Diagram. Position the pointer in the center of the predecessor task box. Drag to the successor task box. On the View menu, choose Calendar. Position the pointer on the calendar bar for the predecessor task. Drag to the successor task's calendar bar. By default, when you insert a task among linked tasks, the new task is automatically linked with the surrounding tasks. For example, if you have three tasks with finish-to-start links and you add a new task between them, the new task will take on a finish-to-start link with the tasks above and below it. You can easily turn this option off, so that inserting a new task does not automatically link it with the surrounding tasks. If autolinking is turned off, you can easily turn it back on. On the Tools menu, choose Options, and then select the Schedule tab. To turn autolinking off, clear the Autolink inserted or moved tasks check box. To turn autolinking on, select the Autolink inserted or moved tasks check box. To select multiple tasks that are not listed consecutively, hold down CTRL and click each task. To select tasks that are listed consecutively, click the first task, hold down SHIFT, and then click the last task that you want to select in the list. If you set Calculation mode for your project to Manual, the successor task will not move. To reset the task constraint to be more flexible, select the task, choose Task Information , and then select the Advanced tab. In the Constraint type list, select As Soon As Possible. Project then schedules the task's start date according to the task dependency. To make task dependencies override inflexible constraints for all tasks, on the Tools menu, choose Options, and then select the Schedule tab. In the Scheduling options section, clear the Tasks will always honor their constraint dates check box. To set calculations to automatic, on the Tools menu, choose Options, and then select the Calculation tab. In the Calculation options for Microsoft Office Project section, next to Calculation mode, select Manual.